World-renowned experts on resilience such as Michael Ungar, Eli Puterman, Kim Schonert-Reichl and Monique Gray Smith presented a diverse array of scientific and educational knowledge on the subject, including the effects of stress on body and mind, what it means to be "at risk", and demonstrating the healing power of reconciliation. Other keynote presenters, including Shelley Moore, Linda Lantieri and Dzung Vo told personal stories and led the audience through bonding activities and meditation sessions. The Dalai Lama Center's conference team included Creative Director and conference Moderater, Maria LeRose, Event Manager Petrice Brett, and DLC staff members Angela Lee and David Samis, Kareen Hudson, Gemma Holland, and Fiona Douglas-Crampton. Our special thanks to Sukh Shergill and Maggie Karpilovski of the Surrey School District, who we worked with over many months to bring the Heart-Mind confernce to Surrey's Bell Centre for Performing Arts - the first time it has been held outside of Vancouver. We'd also like to thank our keynote sponsors, HopeLab and the Dilawri Group, along with the many other financial and in-kind donors, businesses, organizations and individuals who contributed to the production of the conference, including over thirty volunteers. 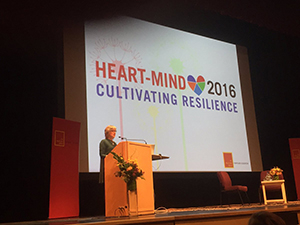 Below is a review of Heart-Mind 2016 in pictures. Please enjoy!